Map 1: A multiplicity of claims. I am nobody in particular. Been around some. Got good eyes and ears and decent cranial facilities. Can work the words sharply. Can add 2 and 2 and usually come up with a number reasonably close to 4. How come I can figure out the Spratleys but the best global minds in the world can’t do it? Well, the reason of course is that they carry so much baggage, these political or militaristic leaders of today . . . so much historical, political and personal baggage. They don’t dare use candor or honesty lest they undermine their national hegemony. We have the Chinese value system which often seems so self-engaged and dismissive of others as to border on, or reach, criminality. We have the American value system which often seems so self-engaged and dismissive of others as to border on, or reach, criminality. We have the Taiwanese value system which is looking a lot like a puppet. And we have the Philippine value system which often seems . . . undefined, with heady aspects of self engagement and criminality. A cool interactive Google map, a little outdated, but visually striking, showing which nation is where in the Spratleys. The Wiki detail on why different states believe they are entitled to all or a piece of the Spratleys. I will not bother to define some terms (e.g., UNCLOS), and presume the reader is reasonably well briefed on these terms, and the recent incidents between Japan and China, and Taiwan and the Philippines. What’s on These Woe-begotten Islands? Thitu (Pag-asa), Philippines. The second largest Spratly island houses the municipality of Kalayaan, a part of Palawan Province. It is covered with trees and has a variety of fauna. It is home to some 300+ civilians (including children) and over 50 soldiers. Population is regulated to protect the islands’ flora and fauna and to avoid tension with other countries. It has a 1.4 km airstrip, a marina, water filtering plant, power generator and a commercial communications tower (Smart). It has been occupied since 1968. It is about 234 nautical miles from Palawan, outside the 200 nautical mile span of the UN-defined Exclusive Economic Zone (EEZ). Taiwan claims Taiping Island, the largest of the Spratly islands, which is covered with shrubs, coconut and mangroves. 600 soldiers are stationed on the island, with lighthouse, radio and weather stations, concrete landing jetty and two wells at the SW end. Hainan fishermen used to visit annually. In 8/93, plans were announced for a 2 km-long airstrip and a fishing port. The existing 1150-meter airstrip was completed in January 2008. The island has been occupied since September 1956, four months after Filipino Tomas Cloma claimed the Spratleys for the Philippines. It is at the outer edge of the Philippine EEZ, but within it. China has military outposts on Cuarteron Reef, Fiery Cross Reef, Gaven Reefs, Johnson Suth Reef, Subi Reef, and the main outpost of Michief Reef. Mischief is a rocky, water level island with lagoon. In February 1995, PRC had built a wooden complex on stilts here, starting its formal occupation of the rocks. In 1999, the Philippines protested over the structures claiming that it is a military outpost and it posed danger to Philippine security, being that it is well within the Philippine EEZ (see Map 2). PRC claimed it is a shelter for fishermen. China has expanded the structures to include 13 multi-storey buildings. Viet Nam has an extensive military presence in the Spratleys (perhaps even a submarine base) and uses most of its claimed islands to support its fishing trade. Islands range from 225 to 350 nautical miles from the Viet Nam coast. The expansive claims reflect centuries of territorial fishing in the area. Malaysia’s presence pertains mainly to fishing and tourism (a diving resort) and is limited to a few islands and reefs near the Sabah coast, all within the 200 nautical mile EEZ drawn from Sabah. What’s the Basis of Claims? Both Viet Nam and China cite a similar historical basis for their claims, going back centuries and citing old explorations and occupancies by this regime or that. You can get an idea of the depth of history from this Vietnamese article: Detailed history of Vietnamese claims to the Parcel and Spratley Islands. I’m sure China could produce a similar record. The slow-motion modern “gold rush” for the islands began in earnest when Filipino private citizen Tomas Cloma staked a claim to the Spratleys in 1956. This incited Taiwan’s military occupation of Taiping Island, and other claims and incidents boiled up from that. Clomas later sold his claim to the Philippine government. The most violent confrontation in the modern era occurred in 1988 when China attacked Vietnamese boats at South Johnson Reef, ruthlessly killing 64 Vietnamese and staking claim to the islands she is now holding and building up, militarily. Vietnam followed up on the clash by fortifying its remaining islands in anticipation of further skirmishes. This article in the South China Morning Post describes the conflict. Arguments regarding historical claim are generally given less consideration in courts than geographic proximity, occupancy and geological integrity. History, after all, would say some African guy, First Man, should inherit the world. Country boundaries have been notoriously fluid in the give and take of exploration and conquest over the years, and to say one spot in time is the defining moment of claim is tenuous. I have not researched the legal finery yet, but it seems to me that there is a distinction between civilian occupancy in the normal course of living, with a self-sustained population and economic integrity, and occupancy that is “forced”, like a military outpost sustained via outside supply ships. Or a fishing outpost where fishermen can rest and sew their nets. Residential occupancy makes an island an integral part of the parent nation; an outpost is a functional usage, not “territory” per se. Proximity is not arbitrary. It forms the foundation of UNCLOS laws defining a nation’s economic interests. Geological integrity seems not to be a foundation of any claim on the Spratleys. The Google satellite view illustrates why. The islands are volcanic and detached from any adjacent mainland or archipelago. Finally there is the little wrinkle that the Philippines does not recognize either Sabah (northern Malaysia) or Taiwan as legitimate, free-standing states. So how do you negotiate with a ghost? So, in summary, history is a mess and defines nothing clearly. It just causes bitter, self-justifying argument. Geographic proximity is certainly a strong foundation for claim, and is the foundation of UNCLOS. Occupancy is a strong basis for claim, but most occupancy on the Spratleys is not a natural economic claim, but a military means to enforce claim. Geological integrity seems irrelevant to the Spratley case. Here are the principles JoeAm uses in defining who gets what in the Spratleys. History is a legitimate claim as it pertains to occupied or unoccupied islands so long as title is represented in an internationally recognized document of clear intent. The purpose of a title is to conform to agreed standards of ownership. Unilateral declaration of title is not an appropriate form for title because it does not convey agreement. In that sense, even the Philippine ownership of Tomas Cloma’s claim is flawed. A military stake in the ground is not a legitimate basis for claim. A military has no claim-making power outside of a legal framework accepted by others. A military can defend a claim based on a legitimate foundation (history, proximity, occupancy, geographic integrity). But it provides no basis for claim. For example, a stake on the moon does not give the US ownership of that particular island in the sky. A military claim is not a legitimate claim. Yes, military force in the past has defined claims. A fishing outpost is not a legitimate basis for claim for the same reason that a military outpost stakes no claim. It is a temporary use that does not perfect title or right to property. Natural occupancy by citizens indigenous to the claiming state, as long as that occupancy is self-sustaining, is a strong legitimate claim. Proximity as delineated by UNCLOS is a legitimate claim to economic control and value from the ses surrounding a nation, using a subordinate principle of the “halfway line” to define boundary lines where the 200 nautical mile EEZs overlap (UNCLOS Article 15, applying to actually territorial boundaries, not EEZ boundaries, establishes the legal precedent for this method). The standing Taiwan and Sabah governments can be recognized as legitimate civic entities subject to change if sovereignty is ultimately determined to be different than what it is today. The minerals and fisheries of the Spratleys are worth trillions. It is Yamashita’s Treasure multiplied over and over again. China’s claim to the Spratleys has little to do with any of the four cited criteria, and a lot to do with her global strategic initiative to acquire resources. This drive involves normal commercial activity (from buying properties to smuggling goods), military procurement of islands, theft of secrets, and wholesale disrespect for the modern notions of intellectual property. China’s stark militarization of the islands and murderous grabbing of islands from Viet Nam in 1988 is a fully transparent statement of intent. China’s words are diplomatic deceits. “The structures are for fishing” and we trust you lesser beings are able to translate this properly to state “keep messing with the Central Kingdom and we’ll blow your brains out”. Pardon me for being so stark. I get tired of the games big people play. Taiwan’s approach is also militaristic. The feeling is very puppetlike. Whether driven by China or emulating China, the claims are devoid of any foundation but force. Viet Nam’s claim wasn’t militaristic until the Chinese raid in 1988. The Philippine and Malaysian occupancies are straight forward: fishing and tourism. Both have a modest military presence for “show”. The Philippines is clearly entitled to (Pag-asa) Island. UNCLOS arbitration will likely show she is entitled to a 200 kilometer EEZ from mainland Palawan Island which is why China will not participate or recognize the outcome of the arbitration. The following states have reasonable economic claim to parts of the Spratleys based on prior genuine commercial use and proximity to their mainlands: Philippines, Malaysia and Viet Nam. Neither China nor Taiwan have presented historical claim in any form that is agreed to by anyone but China or Taiwan. As such, these claims lacks international standing as conforming “title”. These arbitrary claims are enacted by military threat and force. Such use of force steals rights and resources from the deserving owners. The Philippines does not recognize the historical claims of China or Taiwan, objects to the presence of these two nations within her territory, and objects to the militarization of the region. The Chinese and Taiwanese outposts do not have any geographic or geological connection to China and Taiwan whatsoever. Indeed, claim that they are a part of China or Taiwan borders on the absurd. China frequently repeats that solution should come from bilateral agreements, but has taken no initiative to craft a bilateral agreement, anywhere in Asia. China has failed to recommend a solution that illustrates that she respects the rights of other nations. If China believes in bilateral cooperation, China should put forward realistic proposals rather than words that too often ring as threats. Philippine claim is perfected through: (1) longstanding civilian occupancy of Pag-asa Island, and (2) UNCLOS conventions regarding economic rights within a specified 200 nautical mile Exclusive Economic Zone. These claims are founded on internationally recognized laws. They are not unilateral claims. The Philippines prefers to gain international recognition of and respect for her claims through peaceful, legal steps, but, failing in that, will seek to remove interlopers from her territory by any possible means. 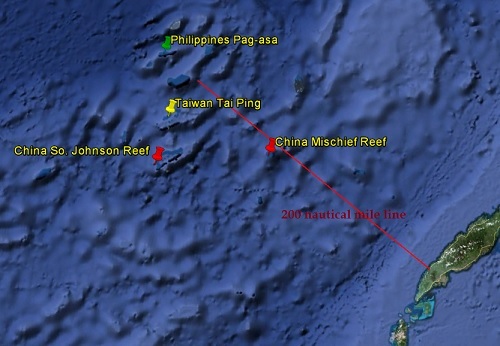 It behooves the Philippines to work with Viet Nam and Malaysia to strike an agreement as to demarcation lines that looks at the Spratleys as if China and Taiwan were not even in the picture. That should be fairly straightforward as the claims do not materially overlap. UNCLOS provides a framework for such negotiated determinations of boundaries. For sure, every time that a Chinese or Taiwanese official opines about the Spratleys, their respective nations should be warned, either publicly or by diplomatic message, that they have no standing to interfere with lawful holders of title in the region, and they should be reminded that their existing outposts are illegal. This was the approach recently taken by the Department of Foreign Affairs, and it should become the official line for every government spokesperson. I knew from the very beginning that misplaced Greenpeace-mentality Filipinos are not there for economics because they will not ever drill oil there to protect the environment. If eco-friendly Filipinos can not allow oil exploratory drilling in Tanon Strait to protect pot-bellied dolphin habitat It is a dead giveaway that they will not drill in Kalaya-an for environment sake. An angel appeared in my dreams also told me that it is not about tourism because the ecologically-conscious Filipinos wouldn’t want gazillions of tourists trampling Kalaya-an. While I was eating my alphabet soup, it spelled “tisoys and tisays”. Filipin government spent milyon-na-milyon in useless-harmless-2nd-hand-cruisers and dozens of “combat” choppers to protect Kalaya-an FOR THE ONLY SELECT FEW TO VISIT THE ISLAND: The Tisoys and Tisays, the oligarchs. The Philippine Protectorate of Kalayaan Island cannot allow hordes of brown-skin-punk’ed nose Filipinos to go to Kalaya-an to protect Mrs. Flora and Mr. Fauna. Kalaya-an is a waste of money. Let the 50-soldier garrison and descendants of Mang Tomas stay there. If they are “invaded”, they’d be happy to acquire Chinese citizenship then apply dual citizenship to Philippines to stay forever peacefully in Kalaya-an and speak tamarind. I bet those conquered Filipinos in Kalaya-an wouldn’t want to speak tagalog like Filipinos in America and Filipinos in Europe and Australia and Canada wouldn’t want to speak tagalog to their children like they do not want to speak tagalog in Metro Manila. ” . . . let the descendants of Mang Tomas stay there . . .” ahahahahaha I’m not sure, but I think I detect a slight tinge of cynicism in your view of the matter. Well, more power to Greenpeace Filipinos because they have been hiding for the past century, as I can tell from all the bombed out coral and seas over-fished to desert. I suspect population on Kalaya-an is regulated to make it feasible to sustain the island as something other than a dump. I don’t know. There is so much gameplaying going on out there from all directions. But I do believe the Philippines wants legitimately to drill for oil and tap the wealth that is there. Bids have been let and I believe accepted, but no development will take place unless drillers are assured that they can peacefully complete the project. China won’t let that happen. I reserve my cynicism for China and Taiwan. I think they are fundamentally thieves. As to investing in ships, the term that is applied is “minimum credible force”, and that to me is a reasonable goal. The Philippines now has no force. It needs enough so that Chinese military ships cannot simply roll through protecting the poaching fleets. They have to force their way past. They will, of course. But then the U.S. cannot stand idly by. China needs to simply back off and let all nations get to the gold. China will gain from that. She can only lose with the current confrontational approach. Per international law, Taiwan and China have no business because the Spratly’s is more than 200 NM from them.Only countries with overlapping EEZ should be talking. Remove the two and this would have been solved instantly. I think another issue that has to be taken into account is the control of trade.. If the seas come under the control of Taiwan and/or China, they could easily shut off anyone who does not flatter them. Half of the world’s trade pass there. Yes, I read that the other day in researching this, that the region is an international thoroughfare for oil tankers and shipment of goods. That is predominantly the US concern, I believe. What I’m striving for is a vision that FOR CHINA is better than her vision that she must militarily claim all the resources. The vision is that China is better off if the Philippines thrives. Peacefully. Rather than this endless strife. Then China can concede the Philippines her right to become economically healthy, both as a market for Chinese goods, and to SELL China the ores, ag and fish products she needs. China could own a piece of this action and profit. It is a more wholesome vision for China right now that her MILITARY leaders must not be able to grasp. 1. Just looking at the map in terms of proximity, even Vietnam should be excluded. 2. The Paracel Islands are equidistant to China and Vietnam, but Scarborough Shoal is closest to Central Luzon. 3. China has extended her economic influence into Africa, Latin America, the Carribean Islands and lately in the US, with Shuanghui International acquiring Smithfield Foods, the world’s largest pork processor and producer. It is revealed, though, that Shuanghui is almost half controlled by global investors such as Goldman Sachs, CDH Investments, Singapore’s sovereign wealth funds, and New Horizon Capital, a firm co-founded by the son of China’s former prime minister Wen Jiabao. 3.1. China, as you point out, should realize that her economic gains are the direct result of economic cooperation with, and economic aid, for countries, rather than military intimidation, aggression and expansion. The aid, as much as possible, should not be extended with strings attached. 3.3. So pork sausages and pork belly may be had by all — except those belonging to religions with specific food restrictions. China needs a shrink who can explain that wholesome behavior feels good. Viet Nam is an interesting case. 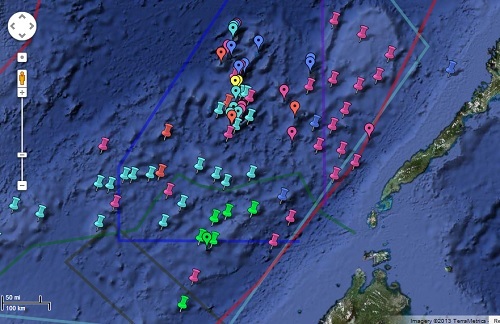 The islands she claims largely fall outside any nation’s EEZ. Does no one own rights to these rocks in the sea? Who protects them? The whole problem now is that China imposes a fishing ban near her coasts to allow the fish to regenerate, so her fleets move outward, in utter disregard for other nation’s interests or rights. I conceded the islands (Spratleys) to Viet Nam because they seem to form a very vibrant part of that nation’s fishing industry, and it would be somewhat pragmatic to bring Viet Nam into the party of the agreed and aggrieved, making the partnership more powerful. A political justification, I suppose, tenuous in terms of the stated principles, but necessary to block China. Are prostitutes pragmatic, do you think? The Philippines should give oil drilling rights to American oil companies. If Chinese touch Spratleys, they touch American oil companies that will touch the United States of America. Once the Filipinos give rights to oil exploration, The Filipinos should understand inherent environmental issues that goes with drilling. They should not make it like what happened at Tubatabaha Reefs where Americans are there to help the Filipinos and yet penalize them big time for reckless driving. 2ndly, the brown-skin Filipinos should be given rights to visit and tour the place which I doubt the government would allow them to except, of course, the mestizos. 3rdly, The Filipinos should not make Spratleys pawn to blackmail American oil companies for more mullah. Filipinos are also known to change the rules once foreigners have put in a lot of money in developing the area ie ZTE, local condo developers and etceteras. 4thly, The Filipinos should not manage the Spratleys Economic Zone because Filipinos are also known worldwide making cottage industries of blackmails it should be given to foreigners for foolproof contracts. I like the concept of US drilling if the Philippines can get product or profit from it. More than she does from her foreign-mined ores, now only around 1% or 2% of revenue. That would assure professional development and ethical dealings. I believe, however, one or more leases in the Spratleys are already let out to Philippine companies. I’ll need to explore that. My prediction: the Philippines will win and China will dismiss the findings. But at least then the Philippines can begin pushing back against China in earnest (see “Peace Fleet” article). Luckily we have this more reliable new administration, remember the so called “suicide” of a young engine on the frigate Bacolod who wanted to uncover the dark activities of his ship? Supporting smugglers and poachers of whatever nationality in Philippine waters used to be another source of income for the navy. (Just imagine Taiwan exposing a similar scam.) I believe that the Chinese know quite good who to approach in the coast guard to look in the other direction. If the military are not square and 200% reliable, the Philippines will have a steep uphill battle to defend its territorial claims. Often the worst enemies are inside. Are the Chines trying to drag arbitration to after the 2016 elections? Amazing that this story has flared up several times since 1949 and that it went through several phases if you can believe Donald Kirk in “Philippine in Crisis”. One just after the Clark base closure was due to a hypothesis that the CIA was “suggesting” the Chinese to build bases, the US having a hidden agenda of being able to come to the rescue of the Philippines and rebuild their bases. Yes, good point, there are probably layers and layers of handshakes and nods among powerful people. I don’t think China is controlling the agenda for the arbitration, but it is likely to take 4 years according to one estimate I read. Plodding process. The intrigues in the spy world and behind the scenes. I tried to get the CIA to recruit me once. They sneered. I’d love to be in the unit that is assigned to mess with China’s mind. Pagasa Island is the seat of the Municipality of Kalayaan, which is part of the Province of Palawan. Being the westernmost territory of Palawan and of the Philippines, the baseline should emanate from there, thereby extending the UNCLOS 200 nautical mile EEZ from Kalayaan… isn’t that correct? An attorney could make that point I suppose. I don’t know the language of UNCLOS well enough to confirm that or deny it. As a common sense layman, I’d say that does not hold true because Pagasa is not substantive enough to qualify as an extension of the “mainland” for the baseline EEZ measurement. I also don’t know what precedents there are for the matter. Isn’t Pagasa the island that a mister Thomas Kloma “discovered” in 1951 for his fishing fleet (Chinese were fishing there earlier) and sold it to the Philippines for 1 peso in 1956? The Philippines forgot about it until new troubles in the Spratlys in the 70’s and Marcos started to proof ownership by building an airstrip. Did all other contestants agree? Isn’t the issue how to decide ownership even after occupation? Something like that, although I’m not sure of the precise dates. Wiki says Cloma claimed the Spratleys in June 1956, as a private citizen. I don’t know the form of the claim or where it was registered. Did he really have anything to sell to the Philippines? If you read the Vietnamese historical record referenced in the article, you will see “evidence” of ownership going back centuries. So I’m sure Viet Nam would not have recognized the Marcos settlement. That is the real problem with historical title. It is all “I say, you say” with no agreed understanding of how claim is perfected. UNCLOS is an attempt to define it better, the problem being that it overlaps what prior to UNCLOS was defined by a stake in the ground and the ability to defend it. The Philippines put a fine stake in the ground by populating the island with civilians. China essentially says her history is a higher and better claim than UNCLOS. Taiwan, too, except when it is convenient to cite UNCLOS (as in the recent dispute with the Philippines). That’s what I was trying to do in the article. Relegate history to a low-value claim because it is so open to interpretation. Use UNCLOS and occupancy and even geological integrity as more relevant evidence for claims. History doesn’t resolve much. Yep, and the Moors can claim Spain, and the Indians, America. That’s funny. A “country” that can’t even define its own ownership is trying to define what the Philippines owns. And staking claims across the seas. China and Taiwan choose weakling Philippines because it has inhabitants with the least resistance in South East Asian Countries. Yes, I believe that is correct, and it is a little ominous, frankly. This was signaled explicitly a couple of months ago when a high ranking Chinese military officer said something like: “Japan, Viet Nam and the Philippines” are “running dogs of the U.S.” and ” you only have to kill one to get the others into line”. The Philippines is the easiest to “kill” because it has no defense. All China needs is an incident like the Coast Guard episode with Taiwan to justify occupying Pag-asa and other Philippine Spratley Islands. Just as ruthlessly as they took islands from Viet Nam in 1988. That’s why the Philippine stance of “non-confrontation” is wise, and why “The Peace Fleet” is a way to face down China without provoking Chinese military action (maybe; it’s a calculation). Well, I suppose craziness is predictable. The brand of insanity that attaches to nationhood and sneering at lessers. I’m reminded of how road rage occurs. People don’t stop to think that there are people in the other car. Kids, good job, church-going people. The car becomes a non-personal object of hate, and the person in it gets assigned to that hate. Same same with international politics. There is a predictability to it. China has no regard for the other “cars” or nations in her region. Just incorporate the islands with all claimants having equal share then develop and share the profits equally. There is more than enough for everybody. All owners sit on the board. Votes regarding management of the property and divisions of spoils must be unanimous. Call it the East Asian Co-Prosperity Sphere, an old concept that still has to see the light of day. Asians will dominate the world! Indeed. I think sharing is ultimately the goal of the ASEAN’s attempt to forge a binding code of conduct. But guess who’s spoiling all the efforts. Chinese are practical people. It will hold out for as long as it can. It will only come around when it sees that the only option is either joint exploitation or leave all that treasure untouched. What we are witnessing is a song and dance routine from China, and all the countries involved. The reality is we do it together or it does not get done at all. The practical people are behaving rather unkindly toward neighbors and edging up against bullets flying with Japan. The military seem to hold particularly strong sway and they seem less than practical to me. Practical would be to come up with solutions rather than being the main problem. Joe, that’s the song and dance you are pointing out. China is using whatever means it has to bluff it’s way to a better negotiating position. The Philippines is doing the UNCLOS thing because a favorable ruling even if unenforceable also gives it some chips to bring to the table. Everybody knows that it’s we all do it together or it doesn’t get done at all. It’s only a matter of time, maybe a decade, before it happens. I agree! Totally! The sharing ratio should be based on proximit distance from where the claimants are. Since PHilippines is closest we get the biggest share. Filipinos in New York don’t seem to worry about Chinese land grabbing. I was at the Independence day parade this weekend. No flyers were distributed and no one was holding sings of protest. Only the same old crap: “Stop slavery” and Stop trafficking our people” sings directed at Americans. I told them that not the US but China should be their concern. They said “we don’t have quarrel with China” I told them that they should stop blaming the USA and look at their own fellow Filipinos for answers. I was told to F… off! Then I just told them that I hate Communist. They tried to push me away! Lol! Visa-denied Left-behind Filipinos will fight off communist China because islands of the Philippines are the only place they got left to live on. American Citizenship card-carrying Filipinos do not care about Philippines because they are more at home in America than in the Philippines. I see flurry of flag-waving Mexicans on Cinco de Mayo. American flags are planted in nearly all American households during July 4th. Armenians, Thais, Chinese name it and they got flags. Philippine flags on June 12 Philippine “independence day” cannot be seen in Filipinotown in Los Angeles and in West Covina where Filipinos are thick. 1st generation immigrant Filipinos turned American seems to be ashamed of their flags. Surely, I would love to have freedom to scuba dive among the reefs in Spratleys but this group of islands are now divided among contesting parties. I cannot even go there in Kalaya-an. Only the mestizos and mestizas who are non-Filipino looking get to swim among indegenous dolphins. The war rhteroic tempo is pumped up because of OIL! Everyone wants to have a piece of the pie especially China that is importing Oil from America and American oil companies giddily export oil to make oil scarce in America to drive up the prices. So, it is about business not about national patriotic pride. It is all about money. For me it is about lying in a hammock with pina colada on the side. “it is about business not about national patriotic pride.” Yes, I think that is true. It is not for the “people’s” pride. But perhaps for the ego-pride of, say, China’s military leaders. And for the power and money. But not for patriotism, which is the giving to one’s country, of peace and well-being. That could be achieved without all the conflict. I agree that only three claimants, Philippines, Vietnam, Malaysia, and tiny wittle Brunei (3.2 nations) have logical claims to the islands. Philippines, Malaysia and Bwunei for proximity, and Vietnam for ancient REAL maps. 1900 –	Vietnam’s Nguyễn Dynasty continued to assert that the state Bac Hai Company had exercised Vietnam’s sovereignty in the Spratlys since the 18th century. 1930	France launched a second expedition with the La Malicieuse, which raised the French flag on an island called Île de la Tempête. Chinese fishermen were present on the island, but the French made no attempt to expel them. 1932	The Republic of China sent the French government a memorandum contesting their sovereignty over the Paracels, stating that the Paracels were the extreme south of Chinese territories, based on the Chinese interpretation of the 1887 treaty ending the Sino-French War. 1933	Three French ships had taken control of nine of the largest islands and declared French sovereignty over the archipelago to the great powers including the UK, US, China and Japan, according to the principles found in the Berlin convention. France administered the area as part of Cochinchina. Japanese companies applied to the French authority in Cochichina for phosphate mining licence in the Spratlys. 1939	The Empire of Japan disputed French sovereignty over the islands, citing that Japan was the first country to discover the islands. Japan declared its intention to place the island group under its jurisdiction. France and the United Kingdom protested and reasserted French sovereignty claims. 1941	Japan forcibly occupied the island group and remained in control until the end of World War II, administering the area as part of Taiwan. A submarine base was established on Taiping Island. 1945	After Japan’s surrender at the end of World War II, the Republic of China claimed the Spratly Islands. The Republic of China sent troops to Taiping Island, and Chinese landing forces erected sovereignty markers. 1946	France dispatched warships to the islands several times but no attempts are made to evict Chinese forces. 1947	China produced a map with 9 undefined dotted lines, and claimed all of the islands within those lines. France demanded the Chinese withdraw from the islands. 1948	France ceased maritime patrols near the islands and China withdrew most of its troops. 1951	At the 1951 San Francisco Conference on the Peace Treaty with Japan, the Soviet Union proposed that the Spratlys belonged to China. This was overwhelmingly rejected by the delegates. The delegates from Vietnam, which at that time was a French protectorate, declared sovereignty over the Paracel and the Spratly Islands, which was not opposed by any delegate at the conference. China did not attend the conference and was not a signatory of the treaty. 1956	Tomas Cloma, director of the Maritime Institute of the Philippines, claimed sovereignty over much of the Spratly Islands, naming his territory “Kalaya’an” (“Freedomland”). The People’s Republic of China, the Republic of China, France, South Vietnam, the United Kingdom and the Netherlands all issued protests. The Republic of China and South Vietnam launched naval units to the islands, though South Vietnam left no permanent garrison. Later in the year, South Vietnam declared its annexation of the Spratly Islands as part of its Phước Tuy Province. 1958	The People’s Republic of China issued a declaration defining its territorial waters which encompassed the Spratly Islands. North Vietnam’s prime minister, Phạm Văn Đồng, sent a formal note to Zhou Enlai, stating that the Government of the Democratic Republic of Vietnam respects the decision on the 12 nautical mile limit of territorial waters. Both the South Vietnamese government and the communist revolutionary movement in South Vietnam continued to assert that the Spratlys belonged to Vietnam. 1961-63 South Vietnam established sovereignty markers on several islands in the chain. 1968	The Philippines sent troops to three islands on the premise of protecting Kalayaan citizens and announced the annexation of the Kalayaan island group. 1971	Malaysia issued claims to some of the Spratly Islands. 1972	The Philippines incorporated the Kalayaan islands into its Palawan province. 1975	The unified Vietnam declared claims over the Spratly Islands. 1978	A presidential decree from the Philippines outlined territorial claims to the islands. 1979	Malaysia published a map of its continental shelf claim, which includes twelve islands from the Spratly group. Vietnam published a white paper outlining its claims to the islands and disputing those of the other claimants. 1982	Vietnam published another white paper, occupied several of the islands and constructed military installations. The Philippines also occupied several more islands and constructed an air strip. 1983	Malaysia occupied Swallow Reef (Layang Layang), one of the Spratly Islands. A naval base and resort was later built at this location. 1984	Brunei established an exclusive fishing zone encompassing the Louisa Reef and neighboring areas in the southeastern Spratly Islands. 1996	The first Philippine-Vietnam Joint Marine Scientific Research Expedition in the South China Sea was conducted aboard the RPS Explorer of the Mines and Geosciences Bureau of the Department of Environment and Natural Resources. 1987	The People’s Republic of China conducted naval patrols in the Spratly Islands and established a permanent base. 1988	PRC warships and Vietnamese transport ships had a minor clash over Johnson Reef. PRC forces prevailed and the PRC won control over some Spratly reefs for the first time in the dispute. 1995	The Philippine government revealed Chinese military structure being built at the Mischief Reefs. Philippine President Fidel Ramos ordered increased patrol of the Philippine-controlled areas, the incident leads to numerous arrests of Chinese fishermen and naval clashes with Chinese pirate vessels. 2008	Taiwan’s President became the first head of state from the claimant countries to visit Spratly islands. His visit sparks criticism from other claimants. 2009	The Office of the Philippine President enacted the “Philippine Baselines Law of 2009” (RA 9522). The new law classifies the Kalayaan Island Group and the Scarborough Shoal as a “regime of islands under the Republic of the Philippines.” This means that the Philippines continues to lay claim over the disputed islands. 2009	Two submissions to the Commission on the Limits of the Continental Shelf were made on May. A joint submission by Malaysia and Vietnam claims jurisdiction over their respective continental shelves out to 200 nautical miles. A lone submission by Vietnam claims jurisdiction over an extended shelf area. The People’s Republic of China and the Philippines both protested the moves stating that they violated agreements made with regards to the islands. 2011	On 18 May 2011, China Mobile announced that its mobile phone coverage has expanded to the Spratly Islands, under the rationale that it can allow soldiers stationed on the islands, fishermen and merchant vessels within the area to use mobile services, and can also provide assistance during storms and sea rescues. The deployment of China Mobile’s support over the islands took roughly one year to fulfil. Que Horror !!! Que Barbaridad !!! The Chinese will definitely do that to 350 Filipino inhabitants in Spratleys not counting the scrawny, underfed, homesick 50 Filipino soldiers stationed there. Lucky for Philippines, Spratleys was not bombed-run by Chinese when they constructed the airstrip in Kalaya-an. Jesus Mary Mother of God … the Fitch and Moody upgrade is inversely proportional to condition in the Philippines. Edsel Tupaz must be lifting some of my analysis to make it into some scholarly literary works in economics which need not require MBA just plain two pairs of eyes. It is henceforth Dr. Mariano Renato Pacifico. Economist at large.